The BJP on Friday described Rahul Gandhi's allegations against Prime Minister Narendra Modi in the Rafale deal as "yet another lie from his lie-manufacturing factory" and accused the Congress president of working at the behest of foreign forces for the cancellation of the fighter aircraft deal. The Prime Minister's Office was directly involved in negotiations with the French on the Rafale deal and Modi was guilty in the scam, Congress president Rahul Gandhi said on Friday in a fresh attack on the government over the fighter jet agreement. It is an open and shut case, Rahul declared, citing a report in The Hindu newspaper claiming the defence ministry raised strong objections to "parallel discussions" conducted by the PMO during the negotiations over the Rs 59,000 crore Rafale deal between India and France. A number of Union ministers from the BJP hit out at Rahul Gandhi after he cited The Hindu report to launch a fresh attack on Modi. He said the Congress-led UPA government had finalised the Rafale deal in 2011 but did not go ahead with it because "it had not got any commission." There cannot be a deal in a Congress government without any commission, Javadekar alleged. "The Supreme Court has said there is no scam in the Rafale deal. Rahul Gandhi does not accept it. Repeating a lie would not make it true," he said. The BJP leader asserted the Modi's credibility among people is high as they believe that he will put national interest first while they know that "the Congress is all about corruption". Referring to the media report that said the Defence ministry had raised strong objections to "parallel discussions" by the Prime Minister's Office on the Rafale deal, he said the story did not refer to the response of the then defence minister Manohar Parrikar on the file. 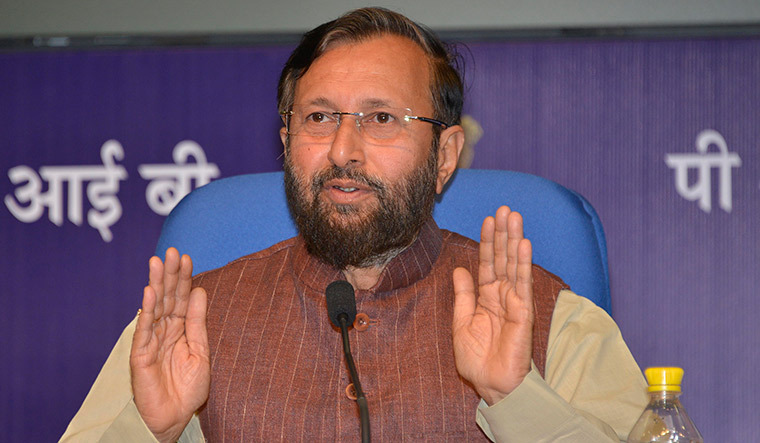 It is the job of the the PMO to monitor works of different ministries, Javadekar said. Defence Minister Nirmala Sitharaman Friday also dismissed the media report on the Rafale jet deal as "flogging a dead horse" and accused the opposition of playing into the hands of multinational companies and vested interests. "They are flogging a dead horse. Periodical enquiries by the PMO cannot be construed as interference," the minister said during the Zero Hour in Lok Sabha. Union minister Giriraj Singh claimed Rahul Gandhi keeps lying on the Rafale deal and took a dig at the Congress chief, saying he now needs to see a psychiatrist as the government has answered all questions raised on the issue and even the Supreme Court has rejected charges of corruption.